American food aid helps around 50 million people every year, but it could reach millions more. Requiring it to be in kind, purchased in the United States, and transported on US-flagged ships makes food aid less efficient and effective than it should be. President Obama’s FY2014 budget would relax the in-kind and cargo preference requirements and by eliminate monetization—the practice of donating food aid to private organizations that sell it in developing countries to fund their projects. The US Agency for International Development estimates that such reforms would help food aid reach as many as 4 million more people for the same amount of money. We estimate the effect to be even greater: between 4 million and 10 million. The costs of food aid reform are few, but the benefits would be substantial. Now is the time to bring food aid into the 21st century. but rising prices mean that the same amount of aid today buys only half what it did a decade ago. At the same time, more people need help because of ongoing conflicts, increased price volatility, and more frequent weather shocks. The solution is to do more with less, and that requires updating a system designed more than half a century ago. and the United States became a major agricultural exporter. But US food aid remains trapped in this 1950s time warp, where food must be bought in the United States and transported mostly (50 percent) on US-flagged ships. Procuring vegetable oils and other more processed foods in the United States is not necessarily more costly, even with higher transportation costs. All of these studies compare similar commodities delivered around the same time, in the same countries. USAID estimates that President Obama’s proposal would US food aid reach an additional 4 million people per year. We estimate the effect to be even greater: between 4 million and 10 million additional people—up to one-fifth more than the roughly 50 million people reached in recent years. Our calculations are explained below. The more ambitious Royce-Bass proposal would maximize the impact of American generosity by eliminating the restrictions that make it so inefficient. President Obama’s FY2014 budget would untie the $250 million in nonemergency food assistance by removing the in-kind restrictions and reallocating the money to a new Development Assistance account. USAID says this account will be used for projects similar to those currently funded by monetization. With the estimated costs of monetization for USAID-managed food aid at 25 percent,  the reallocation would lower the average cost per beneficiary from $50 (2008–12) to $38. That would allow the same amount of aid to help 6.5 million people instead of the 5 million under current policy. In sum, combining our estimates for emergency and nonemergency savings, the administration’s reform proposal could expand the reach of US food aid to somewhere between 4 million and 10 million more hungry people. The more ambitious Royce-Bass reform would have an even greater effect by allowing aid officials to purchase food when and where it is most cost-effective to do so. But there are too many unknowns to make an estimate. would give aid officials increased flexibility to choose the mechanism that best addresses hunger and malnutrition in a given situation, depending on the type of food needed, how quickly it is needed, and the local market conditions. If local markets are relatively well-integrated and access to food, rather than availability, is the problem, cash transfers or vouchers will often be faster and more effective. When direct food distribution is needed, buying it locally or regionally will be much quicker and may also be more cost-effective . 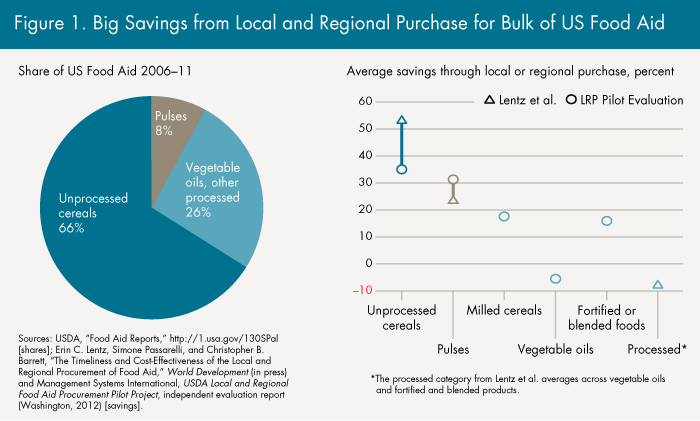 Local or regional purchase will not always be possible, and the United States, as a major agricultural exporter, will be a source for food aid no matter what happens. But the benefit American farmers reap from the current food aid system is trivial—at most 1 to 2 percent of agricultural exports in recent years. Dropping the US sourcing requirement will not have any discernible negative impact. Similarly, the cargo preference requirement for food aid is a costly and inefficient subsidy. If subsidies to US-flagged ships are indeed important for national security reasons, as some have argued, then the funds should come from the Pentagon’s budget, not from the much more modest sums set aside to feed the hungry. While the costs of food aid reform are few, the benefits would be substantial. Our estimate suggests that the proposal in the President’s budget would allow US food aid to reach at least 4 million more people in need, and perhaps as many as 10 million, roughly one-fifth more than current policy. Now is the time to bring food aid into the 21st century. For a brief review of US farm policy, see chapter 3 of Kimberly Ann Elliott, Delivering on Doha: Farm Trade and the Poor (Washington: Center for Global Development and Institute for International Economics, 2006). Also see Elliott, “Subsidizing Farmers and Biofuels in Rich Countries: Should Developing Countries Care?” CGD Policy Paper, forthcoming. Applied Economics Perspectives and Policy 32(4): 624–641. Costs could be less since Congress lowered the cargo preference requirement from 75 percent to 50 percent in 2012. GAO, International Food Assistance (2009) . Costs and numbers of recipients are from the appendix tables in various issues of the USAID’s annual US International Food Assistance Report (footnote 6); FY2012 figures are from USAID, “Fiscal Year 2012 Food for Peace Fact Sheet,” http://1.usa.gov/11mO4tj. http://1.usa.gov/11cFgDd; the fact sheet for FY2011 was provided by the Food for Peace office. It is USDA-funded monetization projects that typically net only 60 cents on the dollar; see GAO International Food Assistance (2011). This calculation ignores $30 million in efficiency gains from ending monetization and $50 million in transfers from the Maritime Administration to compensate USAID for higher shipping costs associated with cargo preference. The analysis in Bageant, Barrett, and Lentz (footnote 8) suggests that the methodology for calculating these transfers frequently understates the actual costs.